This semester, Notre Dame Washington Program students have visited the White House, the Capitol, the State Department, the Pentagon and the United States Institute of Peace (USIP), as part of their core seminar. Notre Dame’s President Emeritus, Rev. Theodore M. Hesburgh, C.S.C., served on the board of directors at USIP and a hall that houses the Institute’s Religion and Peacemaking Center was named after Father Hesburgh in 2010. 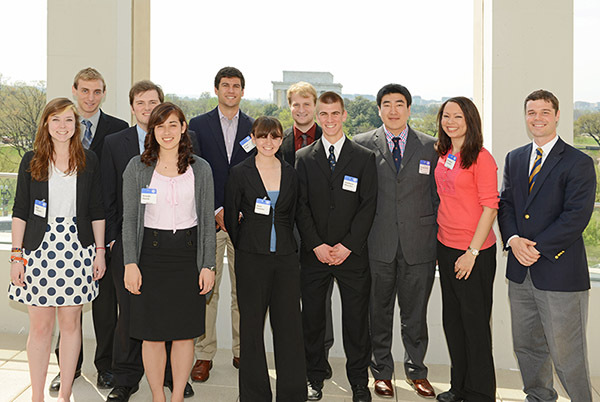 “Students have also met with Francis Rooney, former Ambassador to the Holy See, to discuss the papal conclave, and attended a briefing on human trafficking by Ambassador-at-Large Luis CdeBaca, who coordinates U.S. efforts to combat contemporary forms of slavery,” says Tom Kellenberg, executive director of the Washington Program. Originally published by Susan Guibert at news.nd.edu on April 25, 2013.